Mercedes Benz Unveils Ultimate Golf Cart of Future! Envisioning the best for industry, Mercedes Benz had taken its interest for the segment which is the slowest in terms of four-wheelers. Yes, it is the electrically operated golf cart that will soon see the three pointed star in logo on them in production specific, after the testing will conclude results by next year or so. 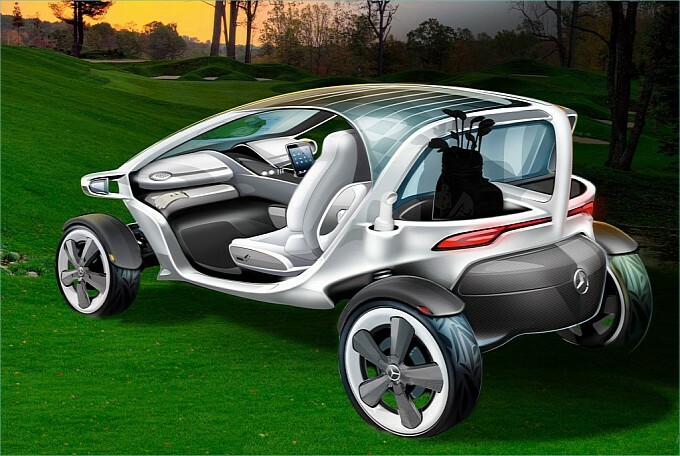 Created by the organization’s designing department of Carlsbad, California, unveiling ‘Vision Golf Cart’ of the future is meant to be a prototype. It charges itself automatically from the roof-mounted solar system, or via manual charging mode using plug in method. Though it is a Merc in true sense, there all loads of comforts embedded in it to blow up your sense in the fullest. Deep stare in the image reveals there is a joystick given to control this car, rotatable panel with docking facility of iPhone/iPad using USB and Bluetooth, air conditioning, infotainment system and even windows. The windows are however sounding new the respective segment but are designed to make the golfer safe in case when the storm hits the golf course for inevitable duration of time. Meanwhile, to add more of the German engineering, Vision Golf Cart is also done with rain sensing wipers, automatically darkening windscreen (for sunny days), and some space at the rear to store umbrella for the additional comfort. There is enough cargo space for stowing two golf bags as well. Designed in a way to be self driven, one can enjoy the drinks on it during the tournaments too. A fridge is embellished under the center console which also provides two cup holders complementing for the victorious toast to be cheered at the turf itself. 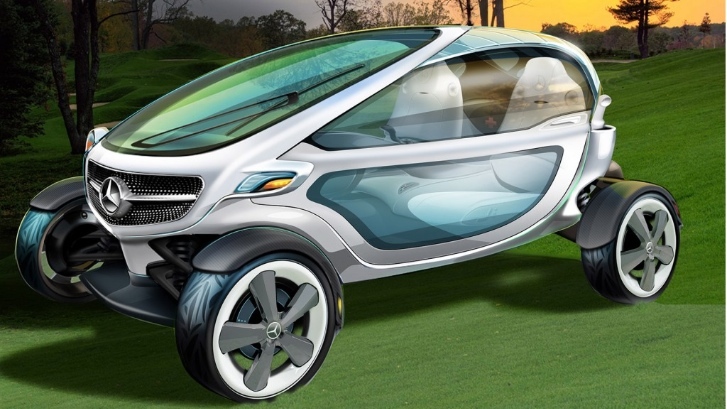 Just added for the information, Vision Golf Cart is an outcome of the competition in which the Mercedes Benz had asked the aspiring designers to come up with the idea of an ultimate golf player’s transport vehicle.